Hello, phone company? 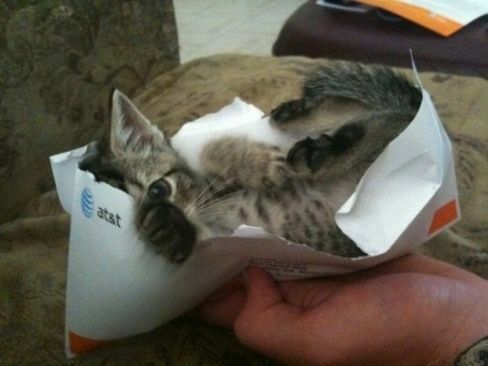 You sent me a cat in my bill. I’m not sure that’s part of my calling plan. Getting non-bill mail is way more fun than getting bill mail. Sorry, phone company. Here’s a Zen reason: when you’re full of ideas, and feel like an over-filled balloon, writing a letter instead of sending an email or talking on Facebook can help you get the ideas out of your head and onto the page. This will help you bleed off some of the pressure and help you keep in touch with your friends and family. There are even Meetup groups centered around snail mail. I’m serious! If you’re here in Chicago, here’s the one I belong to: Snail Mail Revolution. You might find that you like it so much, it will kindle, or rekindle, an interest in small mail art. There’s a large, global community for it, too! My friend Shellie Lewis talks about it on her blog – and she’s got a ton of other inspirational stuff there, too. Check it out, here. What about you, Dear Reader? What’s your favorite kind of mail to receive? Ooh, I haven’t heard of that. Thank you for the tip! I’ll have to check it out. Thank you for taking the time to stop by and comment; I appreciate it!